Not sure where to start? Watch a video and then take related quizzes over time. Get started with this simple 'learning loop' about any concept in the library. 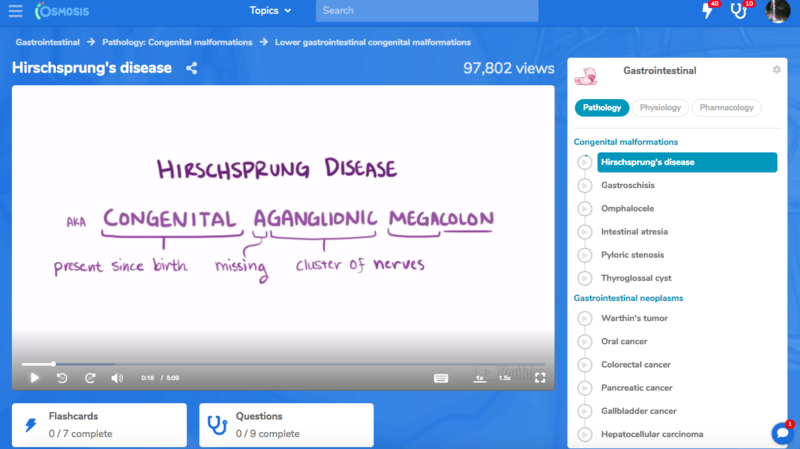 Start with one of our great Osmosis Videos, like this one about Hirschsprung's disease. 4. During the next week or so, keep taking this Spaced Repetition Quiz. Flashcards you got wrong or weren't sure about will be repeated more frequently. 5. Stick with it! Over time, you will start remembering the answers! You will have learned about Hirschprung's Disease. You can learn more about using Flashcards and Spaced Repetition here.